Mature Security Awareness Training - Symtrex Inc.
We all know that there is no long last relative that has left us millions in dollars – all we have to do is click this link – Cybercrime and phishing emails are now extremely professional. KnowBe4 is one of the world’s most popular integrated Security Awareness Training and Simulated Phishing platform, providing a tool to address and manage the urgent IT security problems of social engineering, spear-phishing, and ransomware attacks and at the same time stay compliant with industry regulation like PCI, HIPAA, SOX, FFIEC and GLBA. Effective security awareness training is hard. Today’s security awareness teams often don’t have the support, time, or resources they need to be successful and/or are missing the skills and experience to effectively create a fully mature security awareness program. 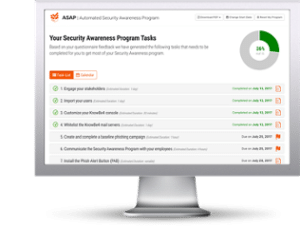 To help you get started we’ve taken away all the guesswork with our Automated Security Awareness Program (ASAP), a revolutionary toof which allows you to create a customized security awareness program for your organization that will help you implement the steps required to create your training program in just a few minutes.